Before Tortoiseshell was finalized there was an experimental forerunner with a much darker, treacle colour. 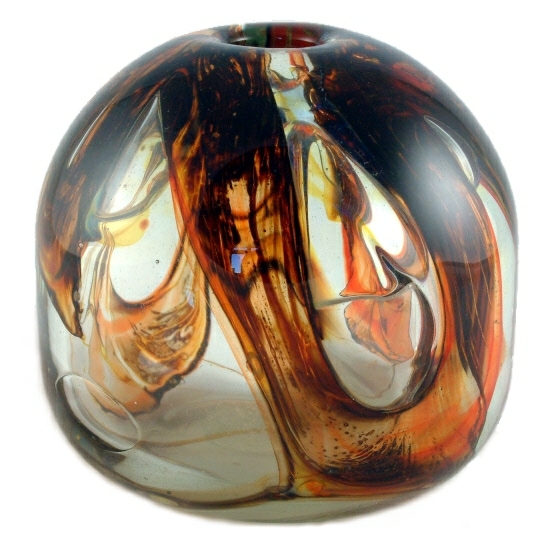 Mark Hill calls the earlier colourway 'brown streaks and swirls' (see pages 72 and 80 in his book ). These were probably made in 1973 and are harder to find than the typical colourway. An inside-out vase 9.5 cm high. It has a coachbolt pontil mark, indicating it was made in the second half of 1973. This item was released from the IOWSG archive in December 2010. 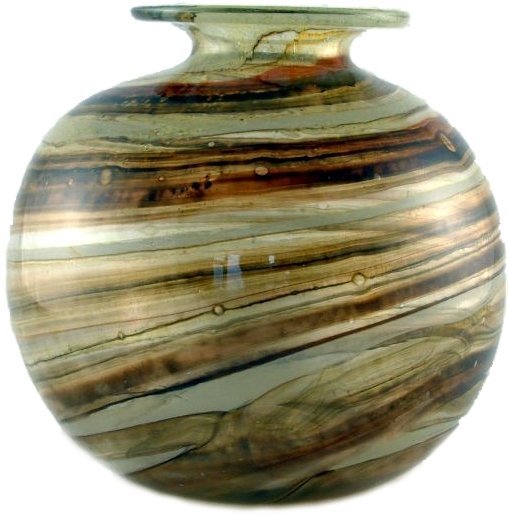 A heavy pot vase, 7.5 cm high and 8.9 cm in diameter. It has a coachbolt pontil mark. This piece is much rarer than the inside-out vase. A heavy attenuated bottle with a distinctive bulbous base, 37 cm high. 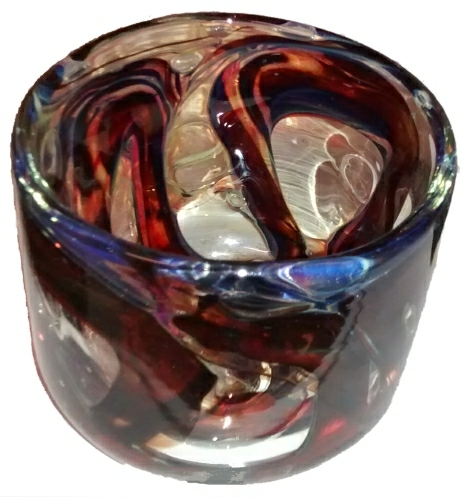 The glass is unusually thick, hence the weight, and has a rough broken pontil scar on the base. These features may indicate an early date of manufacture. The brown colour is dark, and there is a distinctive white stripe as well. Tortoiseshell seems to get lighter in weight and colour with later dates. This fish is said to be made in 1974. It is 25.5 cm long measured round the curve and 5.5 cm high. 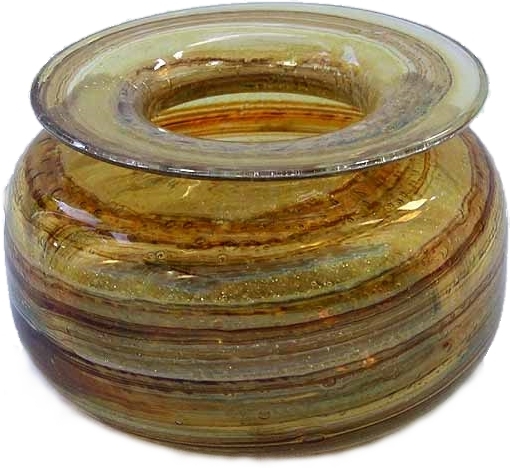 Squat vase, 13 cm diameter, 7.5 cm high. A bell vase, 14 cm high. 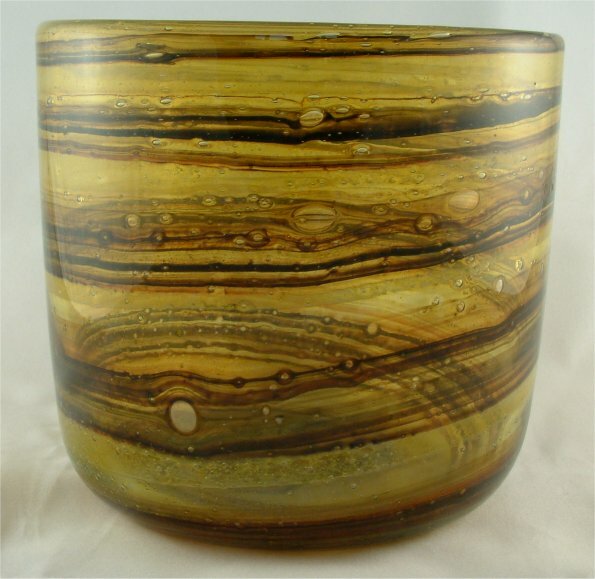 Globe vase, 14 cm diameter, 13 cm high. 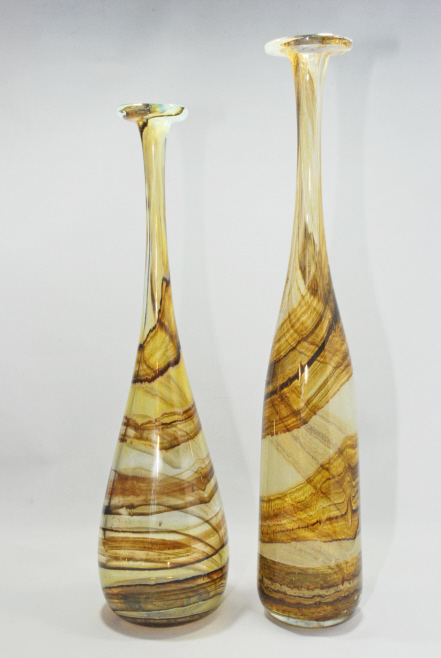 These Tortoiseshell attenuated bottles measure 36 and 40 cm tall. Image courtesy of Mike Collinson.